Dive into the heart of ancient Egypt, play a pharaoh and enter history by building the most grandiose pyramids! 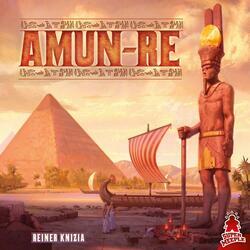 Released in 2003, AMUN-RE is a pillar among the games created by the famous Dr. R. Knizia, multi-international, but also finalist of the Tric Trac d'Or. The game is based on an original auction mechanism with tight management of resources and money. If the game is simple to apprehend, it is by chaining the parts that we take the full measure of the depth of the game. All the difficulty is in the dosage, not in the choice of the action. There are custom meeples in this reissue, a beautiful and large immersive game board, and the heart of the game, the pyramids, are resin!